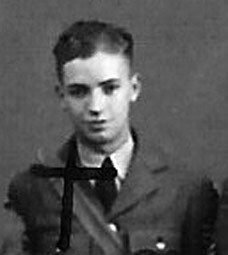 Alistair David William Main joined the RAFVR about May 1939 as an Airman u/t Pilot. Called up on 1st September 1939, he completed his training and went to 5 OTU Aston Down in early May 1940. After converting to Hurricanes he was posted to 249 Squadron at Leconfield on the 28th. On 8th July he shared in the destruction of a Ju88 off Hornsea. Taking off on 16th July Main's engine failed and he was killed when his Hurricane, P2995, crashed and burned out in Copmanthorpe Wood. He was 22 and was cremated at Dundee Crematorium.